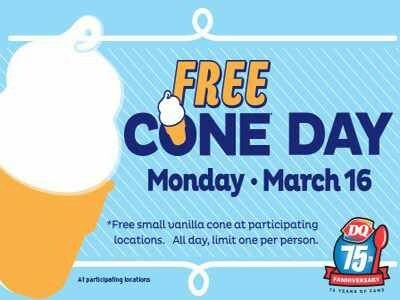 On Monday, March 16th, you have to stop by a Dairy Queen location because you can get a free Dairy Queen ice cream cone. To thank its fans and celebrate the 75th anniversary, Dairy Queen will be giving out a free small vanilla cone to all the fans. Limit one small cone per customer. Head to a participating DQ location on March 16th to enjoy the free cone.